The treatment of chronic radial head dislocation remains controversial. Open reduction of the radial head in combination with correction of malalignment with ulnar osteotomy can be the key to a good surgical result. Between 2001 and 2006, 9 (6 female, 3 male, average age 8.4 (5-11) years) patients were treated surgically for chronic radial head dislocation by one surgeon. The time between trauma and surgery was 7 (1.5-14) months. The procedure consisted of open reduction of the dislocated radial head and reconstruction of the annular ligament in combination with an ulnar osteotomy. An upper arm cast was applied with the forearm in neutral rotation for six weeks. Plates were removed in all patients. Clinical and radiological evaluation took place preoperatively and after an average of 23 (10-49) months. At radiograph 8/9 showed a reduced radial head; in one an anterior subluxation was seen. The range of motion remained the same in 4 patients who had a full range of motion preoperatively. In 2/5 patients with loss of range of motion preoperatively, improvement was seen. There were no serious surgical complications beside one infection. Open reduction and corrective ulnar osteotomy shows good results for missed radial head dislocations in children. 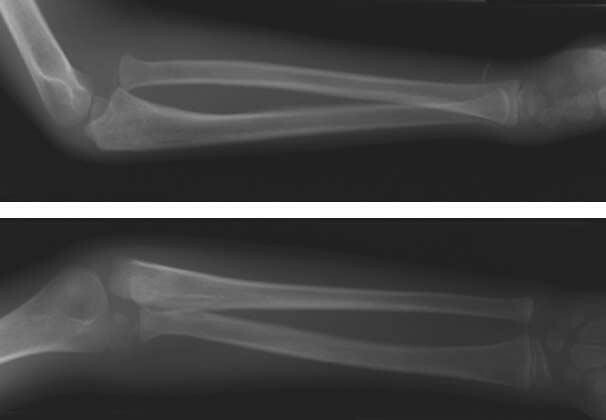 Anterior dislocation of the radial head can be seen in combination with a fracture of the ulna (Monteggia lesion) or as a Monteggia equivalent lesion without fracture of the ulna. Numerous classifications have been developed for these types of injuries; the classification as described by Bado remains the most useful. Bado’s classification divides Monteggia lesions into true Monteggia lesions and ‘equivalent lesions’ based on the mechanism of the injury and the direction of the dislocation . These injuries are rare in children and dislocation of the radial head can be overlooked easily. Persistent radial head dislocation may lead to increasing valgus deformity of the elbow with subsequent ulnar or radial nerve disturbance. Range of motion can be restricted with loss of flexion due to obstruction by the radial head, or loss of rotation due to malformation of the radial head. Functional impairment can be seen due to a combination of stiffness and instability. Secondary degenerative arthritis may be a late sequela [2, 3, 4]. The treatment of chronic radial head dislocation remains controversial and many operations for chronic dislocation of the radial head show unsatisfactory results and are described as salvage procedures . Possibly this is a reason why observation of this injury without surgery is advocated by others . In the present study results were evaluated in 9 children with a post-traumatic persistent radial head dislocation, treated by open reduction of the radial head, reconstruction of the annular ligament and corrective osteotomy of the ulna. Between 2001 and 2006, 9 children were referred to our hospitals for treatment of an anterior radial head dislocation persisting for at least 6 weeks. There were 6 female patients and 3 male patients. The mean age at the time of surgery was 8.4 (range 5–11) years. The right elbow was injured in 5 patients, and the left was injured in 4. None of the patients had been treated at our hospitals initially. All patients with a concomitant fracture of the ulna were treated non-operatively in a plaster of Paris. The average time between trauma and surgery was 7 (range 1.5-14) months. 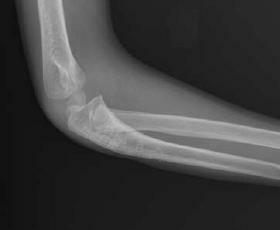 All patients had a history of trauma and no signs of congenital radial head dislocation at standard radiography of both elbows. According to the Bado classification 5 had a type one (an anterior dislocation of the radial head with a fracture of the ulnar diaphysis) and 4 had a Bado equivalent lesion type one (an isolated anterior dislocation of the radial head). Patients were positioned in supine position. One single shot of antibiotics was given prophylactically prior to surgery. A tourniquet was applied and the arm was positioned on an arm table. A Kocher approach was used, with the skin incision extended along the ulnar shaft to expose both the radiocapitellar joint and the ulnar shaft with the same incision. The remnants of the annular ligament were traced and if not identified a reconstruction was done using a small piece of triceps fascia fixed with transosseous sutures. In most cases the radial head was found to be covered with dense fibrous scar tissue, which was excised. Reduction of the radial head was attempted, and its stability was assessed. In all patients stability could not be achieved and an ulnar osteotomy was performed of the ulna to ensure stability of the radial head. An oblique osteotomy was performed at the proximal metaphysis of the ulnar shaft and the osteotomy site was distracted and angulated. The final position of the ulna was guided by the reduction of the radial head. A ‘drittelrohr’ plate was bent to the desired shape and applied to fix the osteotomy. The annular ligament was reconstructed with use of the triceps fascia or with remnants of the ligament itself. In all cases this resulted in a stable position of the radial head and fixation of the radial head to humerus or ulna with an additional pin was not necessary. Postoperatively, a cast was applied with the elbow in 90° flexion and the forearm in neutral rotation for 6 weeks. Active forearm rotation, flexion and extension of the elbow were initiated at 6 weeks. Clinical and radiological evaluation took place preoperatively and after an average of 23 (10–49) months. Clinical evaluation consisted of range of motion, stability tests, orientating neurovascular evaluation and evaluation of pain (none/little pain at activity/severe paint at activity/pain at rest). 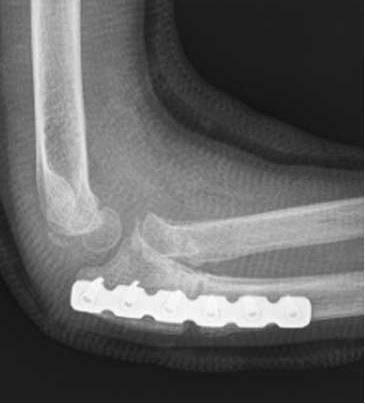 Radiographs in anteroposterior and lateral directions were made to determine the position of the radial head and the presence of any osteoarthritic changes or deformity in both elbows preoperatively; at evaluation radiographs in two directions of the injured elbow were made and evaluated for periarticular ossifications, reduction of the radial head and secondary signs of malformation of the radial head or osteoarthritic changes. No preoperative ulnar or radial nerve palsy was noted. There were no serious complications besides one superficial infection. The radial head was reduced successfully in 8 of 9 patients. In one case an anterior redislocation of the radial head was seen; in this case the time between trauma and surgery was 14 months. In 5 patients with a full range of motion preoperatively the range of motion stayed the same postoperatively. A preoperative decrease in flexion of 10° in 4 patients improved to normal flexion at evaluation in three of them; in one the flexion deficit was the same (case with redislocation). Three patients had a supination deficit preoperatively; in two of them the supination was unchanged, and in one there was a decrease in supination of 10° after surgery. Four out of 9 patients had mild pain after activity preoperatively. At evaluation 9/9 no longer had pain. The radiographs made at follow-up showed no degenerative changes or periarticular ossifications. Despite anterior subluxation or restricted motion, no patient wanted additional surgical treatment, mainly because all the elbows were painless. The radial head plays a key role in maintaining stability of the elbow joint . Although there is no argument against reducing a dislocated radial head immediately after trauma, there are arguments against reducing a chronic dislocation. Unreduced dislocation of the radial head for more than 4 weeks is considered to be chronic. In reconstructive surgery for chronic dislocation of the radial head, sequelae such as loss of elbow function, redislocations and complications have been described. These complications of surgical intervention may be more troublesome than the impairment of the joint due to persistent dislocation of the radial head [2, 8, 9, 10, 11]. Despite the risk of complications, surgery is recommended for active patients as long-standing radial head dislocation will possibly cause restriction of elbow flexion, deformity of the radial head, overgrowth of the radius, instability of the elbow joint and early osteoarthritic changes of the elbow joint [2, 3, 12]. 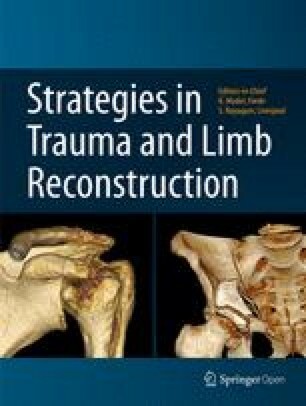 Some authors have recommended ligament reconstruction without osteotomy. Complications after ligament reconstruction alone comprise osteolytic changes, narrowing or growth disturbance of the radial neck, and restricted pronation and supination [8, 10, 13]. In addition to open reduction of the radial head and annular ligament reconstruction, angulation and elongation of the ulna are often necessary to maintain reduction of a chronic dislocation of the radial head [12, 14]. Several methods of fixation of the osteotomy of the ulna have been described. Mehta recommended against internal fixation to allow subsequent ulnar remodelling. However prolonged immobilisation in a cast can cause contracture and possibly delayed union or even non-union . Koslowsky et al. have described an external fixator as fixation, a technique that provides the ability to do a percutaneous osteotomy and perform the correction through a three-dimensional correction of the ulnar axis . However the use of an external fixator is sometimes not tolerated in young children and can be complicated by contracture due to long immobilisation . In the series described in this study rigid fixation of the osteotomy site was done using a plate to allow early mobilisation of the forearm and elbow and to prevent secondary dislocation of the osteotomy (Figs. 1–4). A disadvantage of this technique was that plate removal was necessary in all cases. There is controversy regarding the acceptable interval between injury and treatment. Besides this interval, the age of the patient and the amount of joint incongruity plays an important role . Freedman et al. reported a case of satisfactory surgical correction achieved six years after the original dislocation . Stoll et al. and Hirayama et al. reported that reconstruction could be successfully achieved in children up to ten years of age and at least four years after the initial injury [18, 19]. Obviously the bones of children have the potential to remodel with growth, and their soft tissues are also flexible and less likely to contract. Horii recommends a reduction of the radial head in patients under the age of 12 years when deformity of the radial head is minimal . If reconstruction is considered in elbows with secondary dysplastic changes, these changes have to be addressed during surgery . Dislocations that are seen within a year after injury can be successfully reduced regardless of the patient’s age. In conclusion, open reduction and corrective ulnar osteotomy with plate fixation shows good results for missed radial head dislocations in children. However, plate removal remains a point of concern and the follow-up is too short for us to determine the long-term results and incidence of osteoarthritic changes after reduction.